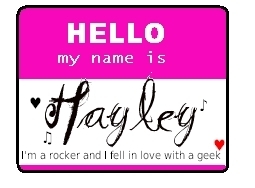 Hello my name is Hayley-for rockzsanders. . Wallpaper and background images in the Total Drama Island club. This Total Drama Island fan art might contain venn diagram, diagram venn's, venn-diagram, and het venn-diagram. do u think u could do me? You Got To Do Lily! Shes A Wierd Girl who only likes boys as friends! Can you make one for Daisy? I'd like it to say "I'm a tomboy who hates boys...or do I?"